This innovative new site provides start-ups and existing small businesses with the tools and resources to start, build, grow, and maintain profitable products and services. The Supreme Business Plan Workshop which will provide in-depth lessons and examples on what should be covered in a professional Business Plan and how to form a business strategy that will ensure long-term growth & sustainability. The Ultimate Entrepreneur Bootcamp offers world-class guidance and mentorship from forming a business idea, deciding on what business to build, through pre start-up planning, the start-up itself, raising capital, managing, marketing, and growing your business into a profitable source of income with great bonuses, tests, free templates and forms. 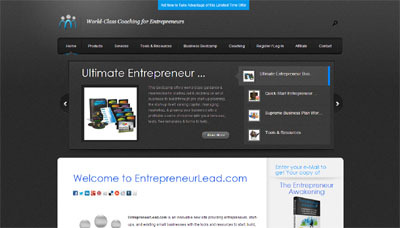 EntrepreneurLead.com differentiates itself from any other sites and services for entrepreneurs by offering a large variety of services and features which, when all integrated with each other, allow businesses to get all of their coaching, business planning, strategizing, promotion, and management accomplished in one place.